The state of the Department of Veterans Affairs is “better” than it was a few short years ago, though work remains, VA Secretary Robert Wilkie told members of the Senate on Wednesday. 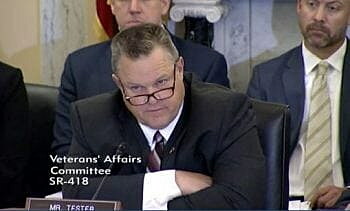 Sen. Jon Tester, ranking member of the Senate Committee on Veteran Affairs, agreed with Wilke’s prognosis, but not without raising concern over perceived trends and lingering challenges. In his update, Wilkie identified four key areas of VA focus intended to meet congressional mandates, including customer service and full implementation of key legislation, such as the Mission Act. He also looks to modernize the agency’s record system. Tester praised the VA on its progress and members of his committee, chaired by Sen. Johnny Isakson, R-Georgia, for funding the agency at record levels and passing key reforms. But Tester also said the stakes were high and that collaboration and partnerships were more critical than ever as the agency evolves. He said he’s concerned the VA may be moving in the opposite direction. Tester also expressed concern over language in Wilkie’s letter to the committee, which suggested the VA was unable to stop routine functions to provide updates to the committee. While it may not be convenient to do so, Tester said, those updates remain relevant to the process. Tester urged Wilkie to address lingering workforce shortages within the VA, saying the issue tops his list of concerns. Though the shortage of medical personnel remains a national problem, not just at the VA, Tester said, Congress has given the agency the funding and leeway to fix the issue. Wilkie told Tester it remains a priority, saying for the first time in 40 years half the nation’s veterans are under the age of 65 and 10 percent of them are now women. Today’s veterans, he said, demand 21st century service. Isakson, the committee chairman, said the VA has made progress in recent years. Not long ago, he said, the VA was falling short on “everything known to man,” though his committee and the VA have begun to correct course.